Assets of Community Value (ACVs) have been with us for three years now and there are 879 pubs listed in England, including around 90 in the Greater London Region. Many people are fixated with the "community right to bid" aspect and somehow feel that they will be obliged to raise funds to buy a pub. Although this is possible, it is highly unlikely. There are only two community-owned pubs in London which have gone down this route - The Ivy House and The Antwerp Arms. The other 88 were nominated primarily to achieve a planning purpose. A good example is The Chesham Arms in Hackney whose ACV status helped to save it from conversion to flats. It is still in the same ownership but the ACV registration was deployed as a tool to safeguard its long-term survival as a pub. Since April 2015, planning law has changed. When pubs are nominated as ACV, their permitted development rights for demolition and change of use are removed. This is very useful to us as it brings change of use and demolition under planning control. Also since the start of 2015, it has been possible for CAMRA branches to submit nominations for ACV status, without the need to collect 21 signatures or to form an association. 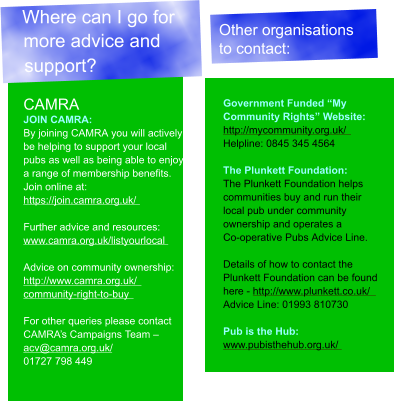 CAMRA is a limited company which does not distribute a surplus to its members. This makes us eligible to put ACV nominations in as CAMRA Ltd, exploiting our branch structure to demonstrate a local connection. 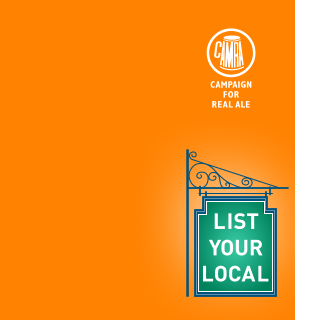 Nominating your treasured local has never been easier and it now provides meaningful planning protection. Our colleagues at HQ have a dedicated online survey tool to make the application process efficient. It really is as simple as ACV! The process is: 1. Identify a pub (or pubs) in the local area that you believe would be a great loss of converted to alternative use 2. Obtain the permission of the ELAC Branch Chairman (Kim Scott) or deputy (John Pardoe) to submit this nomination as ELAC 3. Use the online Survey Monkey form to complete the questionnaire on the pub: https://www.surveymonkey.com/r/FJMTNFX 4. HQ staff will check the info, download (and pay for!) the Land Registry documents, and email all the forms back to you. 5. You then take the form to the Town Hall or email to the Council in question, being sure to obtain a receipt! The Council has 8 weeks in which to make a decision. 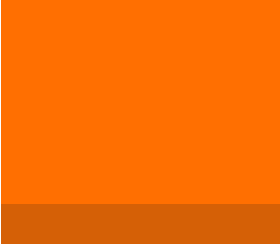 You will be notified when your pub is added to the register. It is a good idea to speak to the licensee / publican so the notification does not come as a shock. Most publicans see registration as a badge of honour. The pub will receive a certificate from the government, and a "This Pub Matters" pack from CAMRA. Don't delay - List Your Local Today.